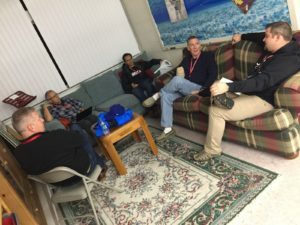 GraceConnect » East Focus Retreat Begins at Ocean City, Md. East Focus Retreat Begins at Ocean City, Md. Paul Mutchler and Jack Galle get re-acquainted after the first session. The East Focus Retreat kicked off late this afternoon at Ocean City, Md. 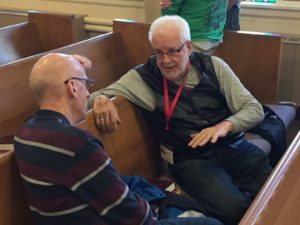 During the next 48 hours, pastors and ministry leaders from around the eastern U.S. and Canada will look at “Developing an Apprentice Culture.” The sessions are led by Clancy Cruise, executive director of the Fellowship of Grace Brethren Churches and pastor of Marysville Grace, a Grace Brethren congregation in Marysville, Ohio. Scott Avey, church planter in Maryland, who former served as worship pastor at Grace Community Church, Frederick, Md. (R Greene, pastor), is leading worship. The evening session allowed time for discussing practical lessons about mentoring. Sessions are being held at the First Presbyterian Church in Ocean City. Participants are staying at a nearby hotel, where the meals are held. Cruise kicked off the sessions talking about Moses and this relationship with his father-in-law, Jethro, who helped him to be a better lead. After dinner, they broke into smaller groups to discuss lessons learned while mentoring.